Often there is a misconception that cholesterol is all bad. The truth is that cholesterol is necessary to many functions in the body. That is why the liver is able to produce about 75 percent of the cholesterol needed to manufacture cell membranes and carry nutrients throughout the body. The problem with cholesterol comes when it is changed from its original liquid state, which flows freely through the blood vessels, to a solid state that appears as a waxy build up in the arteries. As cholesterol moves through the arteries it is naturally in a liquid state. When there is an excess of cholesterol is doesn’t move as freely. This can cause it to adhere to the walls of the arteries. Here, it crystallizes. During this change from a liquid to a solid state the cholesterol expands and can burst. Particles are then sent into the bloodstream, which starts the naturally occurring clotting process. The clots form and can become bigger. It’s a double edge sword when cholesterol turns from liquid to solid. Not only does it clog the arteries, making them narrower and harder, but it creates blood clots. Blood clots can move through the arteries and then become jammed in smaller blood vessels. When this happens the effect is a stroke or heart attack. The best way to prevent cholesterol from changing to a solid state is to control the levels in the body. The body, as mentioned above, produces most of what the body needs. How much the body produces is a matter of genetics. The part you have immediate control over is how much cholesterol you add to your body through your food choices. In addition, you can program the body to produce less cholesterol, without medication, by making planned food choices and complimenting them with specific supplements. 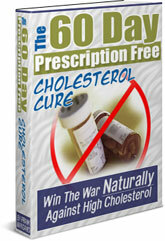 To learn more about how to do this, get The 60-Day Prescription Free Cholesterol Cure.